It is the easiest litmus test for truth and it is always right. If a thought does not line up with the Word of God then it is a LIE of the enemy. Believing the lie sets down roots that grow into strongholds. Take captive every thought and make it obedient to Christ. It won’t do it on its own. What I do not control will absolutely control me. There was a time in my not so distant past I hit a period of discontentment brought on by thoughts bombarding my mind. It was continuous, like a barrage of bullets and I couldn’t turn it off. I would read or recite scripture in my mind over and over. That would work only until I stopped. The lies and deceit continued incessantly until I said, “Enough!” I took to my notebook and drew a line down the middle. 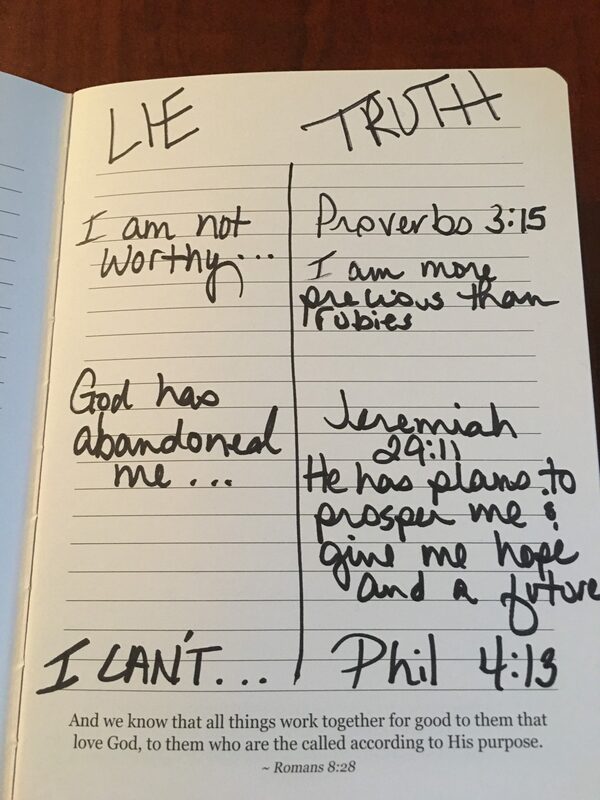 On the left side I wrote LIE. On the right I wrote TRUTH. Pages upon pages I wrote, looking up scripture in every effort to extinguish the fiery darts that impaled my mind. Each lie I sent back to the pit of hell where it belonged. Trust me when I say I am not inoculated against this sort of attack, however, I am far more prepared for battle. I know what works, the truth. I know who is the Author, King Jesus our Lord God Almighty! It tells us in Matthew 4:1-11 that Jesus was tested in the wilderness and defeated the devil in desert with three scriptures. Are you being tested in your wilderness? No matter how parched, desolate or discouraging your desert is, you too have the power and authority to defeat the devil with scripture. You may have to stand up in your living room and shout at the top of your lungs to flee, but you DO have the power and authority. The enemy will flee from you. Guard your heart and mind and know that this will not be the last you’ve heard from him. The devil does what works, but you have the power to claim victory for God’s glory! Remind the enemy just how big your God is. Boldly remind him how the story ends… he lost! It is written. It is done!